After expressing his discomfort with the museums director, Laura Van Broekhoven, he was invited back with four other Maasai leaders from Tanzania and Kenya. The purpose of the visit is to realign stories and descriptions of artifacts, showcase their powerful films and discuss how they use participatory video to bring sharply into focus their current land rights campaign. 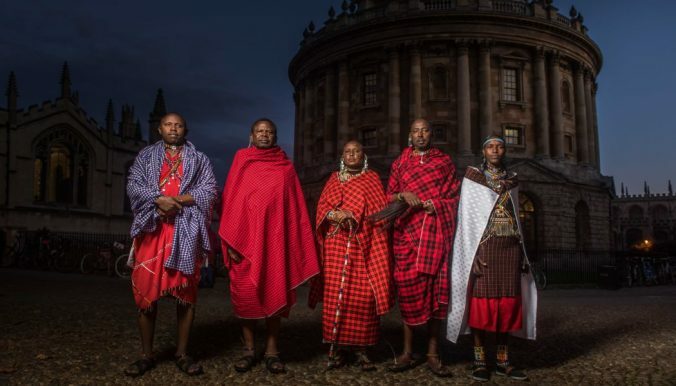 The Maasai leaders will work with the museum to change the way their living culture is represented beyond the framework of the imperial past. This is especially important as the delegation has identified five of the sixty objects they have examined as sacred, which “they would not expect to find elsewhere apart from within their community.” One of which is an orkator, a bracelet that symbolizes the death of a father and is a form of inheritance that would be passed down through generations. As the bracelet cannot be sold or even given, it represents the darker side of many imperial ethnological museums. The Maasai believe that bad fortune may have come upon the family from which it was taken. While this model of “originating-communities” visiting a museum for a week at a time is not sufficient to break down the colonial structures upheld by museums, the Pitt Rivers Museum is taking a step in the right directions by acknowledging the narratives of the people from these living cultures. This is a great idea. Let’s hope it’s modeled around the world. Perhaps funders will make it possible for tribes and other communities to work with museums to influence the stories they tell. In this case, these objects can continue to educate the people who visit the museum since they are not easily available in other parts of the world. Hopefully, the Oxford museum will digitize these objects and their new stories so that people who will never visit, can learn more about this interesting group.